The future in their webbed feet. Platypus is a new group of youth collaborating with Wunderbar. So far, our very focussed focus group have chosen their group name, and now they are recruiting a larger group of 12 – 14 year olds to conceive, produce and deliver a project as part of Wunderbarʼs programme. 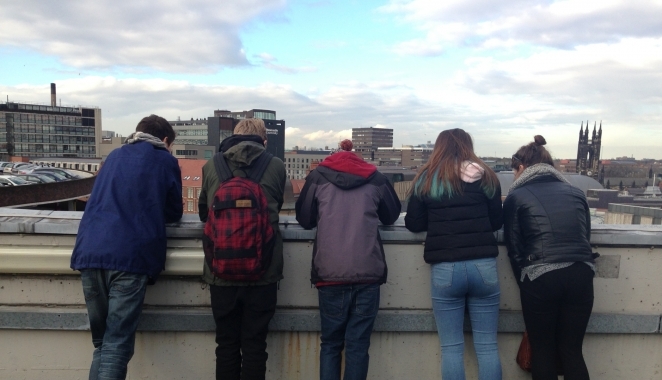 The process is designed to explore the cultural and political climate in the North East right now, especially the young person’s role and agency within this landscape. Together we are exploring what Newcastle has to offer and formulating Platypus projects inspired by the Wunderbar way. Amongst other things, Platypus is inspired by the ethos of Star and Shadow Cinema, and by the Young Mammals projects established by Mammalian Diving Reflex. So the group doesn’t work through a hierarchy and roles are allocated fairly. Adult Platypus facilitators don’t seek a position of authority over the group. Instead, we aim to provide an arena where everyone has equal freedom of expression to debate, challenge, create and play. Read more about our ethos for collaborating with young people.